Lakeland dentist Dr. Everet Lake and two more Coast Dental team members donated their time and skills at the charity event for uninsured and underinsured people in Pasco County. 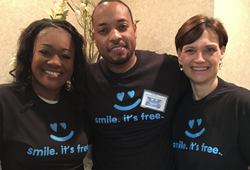 Coast Dental North Lakeland team members Terrell Moore, Dr. Everet Lake, and Suzan Sweeney, RDH, volunteered at Dentistry of the Heart on Feb. 5, 2016. It was one of the most fulfilling experiences I've ever had. For Coast Dental dentist Everet Lake, DDS, the smiles began at dawn. He joined Coast Dental hygienist Suzan Sweeney, RDH, and dental assistant Terrell Moore shortly before 7 a.m. to volunteer at Friday’s Dentistry from the Heart event in New Port Richey. They joined dozens of dental professionals, donating their time and skills to help hundreds of uninsured and underinsured people receive much-needed dental care. This was Dr. Lake’s fourth year volunteering at the event, and the second for his hygienist. They worked from 7 a.m. to 5 p.m., treating dozens of patients who needed a teeth cleaning, filling, or an extraction. Altogether, the group of 19 doctors and 7 hygienists treated close to 400 people. "It was one of the most fulfilling experiences I've ever had," said Suzan Sweeney. "I've been a dental hygienist for 33 years and it was very rewarding to give back to the community. Everybody is so thankful that we’re there to help them." "People wait all year for this. They camp out all night. At the end of the day, you’re tired and beat, but you feel good," said Dr. Lake, who works at Coast Dental North Lakeland. The Dentistry from the Heart event was started by Dr. Vincent Monticciolo, and takes place at his private dental office. Volunteers have treated 450,000 patients and contributed $50 million in donated dental care since 2001. Dental decay is rampant, with 92% of adults over the age of 20 having had at least one cavity in a permanent tooth, according to the National Institute of Dental and Craniofacial Research. If untreated, the decay can reach the nerve and create a sharp or persistent toothache. Fortunately, regular teeth cleanings combined with proper oral hygiene at-home can remove plaque build-up and reduce costly problems. To make an appointment with Coast Dental, call 1-800-32-SMILE or visit CoastDental.com. Coast Dental, P.A., with its professional associations, is one of the largest providers of general dentistry and specialty care in the United States with affiliated practices operating as Coast Dental and SmileCare in Florida, Georgia, California, Nevada and Texas. Coast Dental offers family dentistry services at all of its locations, plus many offices offer orthodontics, oral surgery, endodontics, periodontics, and pediatric dentistry. Coast Dental Services, LLC is a privately-held practice management company that provides comprehensive, non-clinical business and administrative services to its affiliated practices.